Would you like to improve your current sales process, improve the productivity of your sales force or chart a more direct course toward achieving this year's revenue goals? Is it time to take a more proactive and systematic approach to performance management, and to driving your sales effort? If your answer to these and similar questions is yes, then we can help. Our associates are well equipped to discuss all phases of sales management, and can collaborate on everything from recruiting and skills development to team motivation and retention. You can consider project-based solutions or simple retainer programs, handled on a whatever-it-takes basis to achieve your specific goals and objectives. Please contact us for a no-cost preliminary assessment. If your company is feeling the need for a senior-level sales executive, but can not yet justify a full-time resource, we have the solution — On-Demand Sales Management Services. With a combination of scheduled on-site interactions and on-demand access we can assist with every aspect of sales management, from strategic planning to hiring and motivating your staff. Not everyone can be a sales mentor. We can provide hands-on support, input and guidance to help perform these tasks effectively while you continue to develop and run your business. Over 1/3 of all turnover takes place during the first year! Effectively orienting and engaging new sales people is an important, yet demanding task, and one that can significantly impact productivity and retention levels. Given the direct and associated costs of ramping-up, the best approach will be organized, consistent and comprehensive — but it need not be expensive! 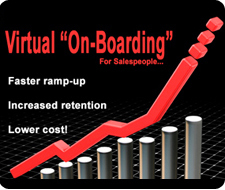 We have created a fully-customizable six-to-ten-week virtual on-boarding program for your new or recently-hired sales people, which facilitates immediate engagement, eliminates travel and lodging costs, and enables participants to absorb material at a more comfortable pace that is consistent with adult learning styles. Customized to meet your specific objectives and to suit your team's developmental needs, these programs can even allow various department managers from your organization to become strategically involved, each presenting an overview of how their department interacts with and supports the sales effort. During the implementation phase, participants will be completely engaged via interactive, instructor-led virtual sessions run twice per week. This enables participants to instantly apply the material presented and seek immediate feedback at the next session. In addition, we'll work with your team to go beyond sales process & selling skills to incorporate organizational structure, business development & networking skills, and CRM system use. Is your current sales management team being stretched? 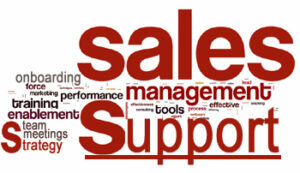 Does your sales management effort need a boost? Are you looking for fresh ideas and better ways to hire, on-board, ramp-up, motivate and lead your sales staff? If so, Paul Charles & Associates can bring about the results you are looking for. New perspectives and unbiased encouragement from an experienced senior sales executive can make a big difference to a new or developing sales manager. Let us help you develop a strong sales management effort by sharing best practices, performance management fundamentals and proactive organizational tools.